Kyle forming a taper using our Little Giant soon after he finished refurbishing it. Our refurbished 1918 50 lb Little Giant in the metal studio. 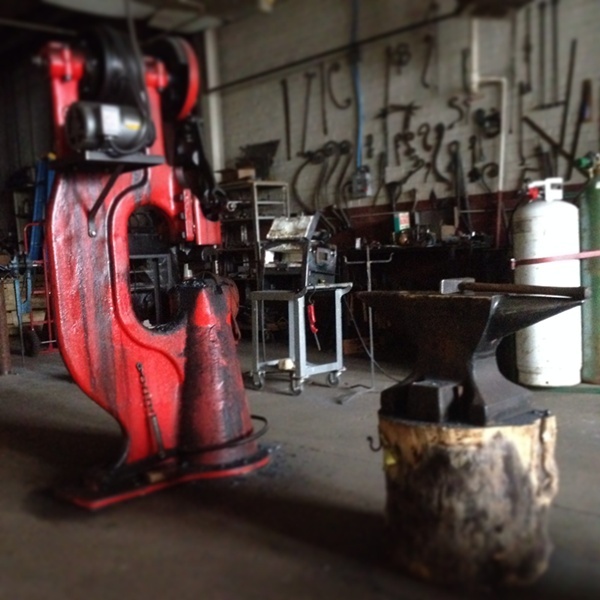 The power hammer is the workhorse of the modern blacksmith shop, replacing the traditional role of the striker in moving and shaping heavy stock. These impressive industrial machines have been around a long time. Trip hammers were known in China and Greece as early as the third century BC. During the 19th century, giant steam hammers were developed alongside steam locomotive technology. Line-shaft powered, and later electric motor powered mechanical hammers have been used by blacksmiths and other metalworkers since the late 19th century. In fact, those very machines are still used in metal shops today-- our own refurbished 50 lb Little Giant hammer was built in 1918!